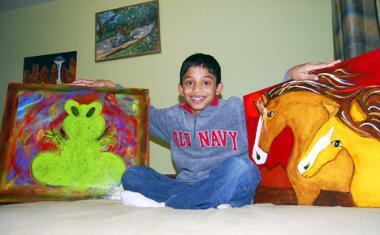 Chirag Vedullapalli, age 10, is a talented artist. He decided to sell his art and raised thousands of dollars for The Seattle Children’s Hospital through a charitable organization he helped create. He not only shares his own art with others, but he also helps other children learn art through workshops he offers. Let’s explore how Chirag has seen his vision come true through his interview below. AK: How old were you when you first started painting? CV: I was 4 years old when I started painting and never stopped after that. AK: What inspires you to paint? CV: I get inspired because I can help kids with my gift. I also get inspired by animals, my family and friends who appreciate my art. AK: What themes do you portray in your art? CV: My paintings tend to have a lot of bright colors, animals, perspective of moms and landscapes. I am experimenting with different styles and themes to find my niche. My favorites are rainbow series of animals. AK: Who is your favorite artist? CV: Pablo Picasso and Van Gogh are my all time favorites. My 2 favorite mentors are Miska Salemann and Ricco Stephano. AK: What is your favorite part about painting for charity? CV: My favorite part is helping kids through my passion in my art. I never knew that I could help other kids but because lots of people help me by buying my art, I am able to help other kids who need the help. This is my favorite part about painting for charity. AK: What do you plan to do/be when you grow up? CV: I plan on being an artist who can spend a lot of time with horses. AK: What are your goals for Creative Children for Charity? CV: My goal for 3C is to help hundreds and hundreds of kids to create their masterpiece using real paints and canvas. We kids can help charities to raise money to support kids who need help. AK: Can you explain the workshops you do? CV: 3C workshops are cool and fun. It is usually 2-3 hours. we organize the table with real art supplies and give step by step instructions to create their masterpieces. We usually pick a theme to do at the workshop. I love the workshops we do at parks. We have done over 10 workshops in last 2 years. My favorite one was at my school when my classmates created their masterpieces. AK: What other interests do you have? CV: I love to make jewelry, mixed media and make special desserts for my family and friends. AK. Anything else you would like to add? CV: I love painting and it is my passion. I feel blessed that I am able to use my gift to help the community in a positive way. AK: What inspirational advice do you have for kids who wish to follow a similar path? CV: Be creative and never think you are limited to do anything and the most important rule is to have fun when you are being creative. AK: His background story about how and why he got started painting and who his inspirations and mentors are. Chaitra: Chirag as a baby loved to play with colors. He would spend hours playing with colors when he was only 3 yrs old. When he was about 5 our friend Linda spent some time with him and being an artist, she recognized some unique skills that Chirag possessed. With her encouragement and our observations of his lack of excitement for soccer or basketball, we decided to nurture his art skills. When we moved to Seattle at that time we found his first teacher Mrs. Sally who let him explore his vision in a structured class. We could see him maturing as an artist within a few months and we did get a lot of positive feedback from friends and family. When he was about 7 we met Miska, an accomplished artist. Chirag quickly became his apprentice and both Miska and Chirag love to create art together. Ricco also has great influence on Chirag and Chirag looks forward to working with Ricco whenever he can. AK: Why did he decide to start painting for charity? Chaitra: In the early years, it was our choice to sell his paintings for charity which was very well supported by our friends, family and community. We have always encouraged Chirag to be a responsible human being and he has continued that spirit and enjoys the feeling that he too can help somebody in his own way. AK: How did his workshops come about? Chaitra: When Chirag was about 9 years old he shared with us that many of his friends were talking about what he does and he realized that many of his friends have many talents that can somehow be channeled to help other kids. That’s when the idea of creating this program took root and has blossomed as Creative Children for Charity where kids come together and create works of art and raise money for charities supporting other kids. AK: What are his goals, present and future? Chaitra: Chirag believes that all children have the capacity and capability to share, provided there is a channel that enables them to activate that giving nature all kids have in them. Chirag would love for this program to keep growing so everyone in their own community can adopt this program and implement it in their own way and help other kids in need. Eventually his long term goal is to have one million kids participate in such events.